So can jet lag be avoided? Or at very least minimised? According to Qantas long-haul pilot Captain Rob Meeks, there is no cure, but there are ways to help reduce the effects. 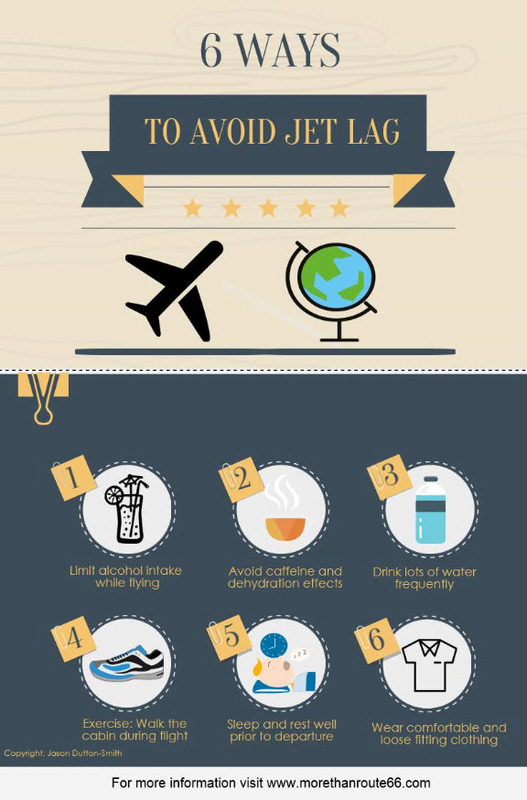 Take a look at our top six ways to avoid jet lag in this handy guide. While a glass of wine is a welcomed meal partner, limiting your alcohol consumption while flying will help reduce dehydration effects; one contributing factor of jet lag. The air humidity in the cabin while flying is much lower than what we are used to. This can bring on dehydration far quicker than on the ground and accelerate the effects of alcohol. Similar to alcohol, avoiding caffeine while flying will not only help reduce the effects of jet lag, but also reduce the onset of dehydration. Plus, it will allow you to rest more on the long flight ahead. Save the tea and coffee intake for when you arrive at your destination. Dehydration will not only accelerate jet lag symptoms but it can also cause headaches; an unwanted flying companion. Drink lots of water to stay refreshed and hydrated and don’t worry about going to the bathroom too often as exercise during flight is recommended (see point 4). Sitting in one position for too long is not only uncomfortable and a cause of numb-bum-a-nitus (OK, I made that word up, but it’s a real condition! ), it can also onset Deep Vein Thrombosis, a serious and potentially fatal blood clotting issue. Walk around the cabin and wriggle your toes and stretch often to remind your limbs of who they are and what they do. Not being rested prior to departure can make you restless and irritable on the flight. Sleep well the couple of days prior to departure and rest when able during the flight. The more rest achieved, the more refreshed you will arrive at your destination. If sitting in an airline seat (even if in the pointy end) you will need to shift and adjust during your flight several times. Wear clothes that are comfortable and loose that won’t wrap or twist around your body. Do you have any other suggestions to help avoid jet lag? Let us know in the comments below.